Simon & Schuster, 9781451697223, 368pp. Niki Kapsambelis was born and raised in Boston, Massachusetts. She worked for several years as a newswoman for the Associated Press in New England, Los Angeles, and Pittsburgh. Her work has appeared in publications around the world, including The Washington Post, Los Angeles Times, and People magazine. She lives in Pennsylvania. The Inheritance is her first book. 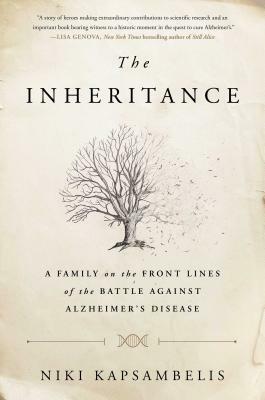 "Kapsambelis skillfully interweaves the quest to conquer Alzheimer’s with the saga of a few families at the center of the latest research....At its most compelling, The Inheritance is a portrait of the DeMoes’ experience as both Alzheimer’s sufferers and research subjects." "A model of immersion journalism, it is especially notable for its specificity and author Niki Kapsambelis' empathy. The DeMoes laid bare their lives, and Kapsambelis repays their candor with a warts-and-all portrait softened by fondness and respect." "In sometimes heartbreaking detail, The Inheritance describes the impact of the disease on individual family members." "Excellent, accessible.... A science text that reads like a mystery and treats its subjects with humanity and sympathy, this volume should be of interest to everyone, as Alzheimer's is now known to be a major cause of dementia in the elderly and because we are facing a potential epidemic as the baby boom generation ages." "Kapsambelis, an empathetic reporter and storyteller, obviously cares deeply for the DeMoes... With its ethical quandaries and likeable characters, this absorbing story will be of interest to medically curious readers." "In her debut, journalist Kapsambelis builds a compelling narrative about Alzheimer's disease around one North Dakota extended family.... In addition to clear discussions of the disease's history and research, Kapsambelis successfully portrays Gail, Galen, and their extended family as fully fleshed individuals. An educational and emotional chronicle that should resonate with a wide variety of readers." "The Inheritance is the story of the DeMoe family, plagued by familial, early onset Alzheimer's disease. It is a story of heroes making extraordinary contributions to scientific research, of crusaders driven to change the course of this disease for the sake of their children, the next generation, all of us. I felt honored to read this important book, bearing witness to a historic moment in the quest to cure Alzheimer's." —Lisa Genova, New York Times bestselling author of STILL ALICE? "Niki Kapsambelis has produced an unflinching narrative of a family in an unfathomable situation, seamlessly weaving in the history of the disease and neuroscience's ongoing race against the clock to find a cure. This is a truly important book." "Kapsambelis is a beautiful writer whose storytelling transports you. I fell in love with the big, loud, awesome DeMoe family and was inspired by the doctors on their long, strange journey into Alzheimer's research. The Inheritance offers a rare, human glimpse at this harrowing disease." "Science is people. Niki Kapsambelis doesn’t let you forget that for one moment in this very human story. The Alzheimer’s community is so lucky to have this first-rate storyteller. Her book tackles the disease from every possible angle." "Niki Kapsambelis adroitly weaves the saga of a family with the stories of the scientists, who are working to develop therapies for this disease. Her insightful reporting makes it impossible not to marvel at the courage of the DeMoe family."